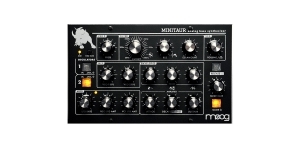 Minitaur is a fully analogue monophonic synthesizer in a desktop version with a powerful "big" sound, especially within the bass range. 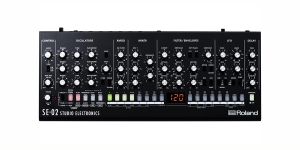 It is a successor of bass synthesizers Taurus (Taurus 1, Taurus 2). It is based on two voltage controlled oscillators (VCO) generating a sawtooth wave. For each of the generators, frequency tuning is provided and the saw is converted to a meander (activated with illuminated buttons). The signal from the VCO enters the mixer, represented by two controllers (VCO1 LVL and VCO2 LVL). Further, the mixed signal enters the filter section. 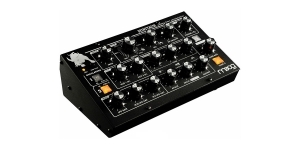 The voltage controlled low-pass filter has a classic Moog structure. The cutoff frequency, resonance frequency and the depth of the envelope generator are provided. 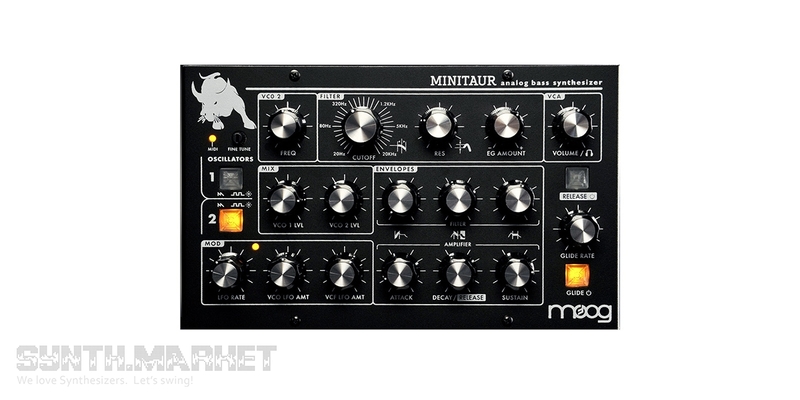 Minitaur contains two envelope generators, one routed to control VCA, the second - VCF. Each of them contains an attack, decay/sustain and release adjust. Sustain function is activated by the button. 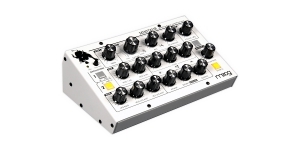 To expand the modulation capabilities, a low-frequency oscillator (LFO) is included in the module. It can produce a triangular wave within 0.01 and 100Hz. Separate depth modulation controls for VCF and VCO are provided. 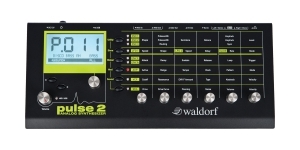 All LFO parameters can be controlled via MIDI. The "Glide" function is activated by the button located in the lower right corner of the module. For glide, you can adjust the glide rate - transition time from note to note. In the upper left corner of the control panel the global adjustment knob and the MIDI activity indicator are located. On the rear panel of the module there are inputs for analogue control signals: pitch CV, filter CV, volume CV, gate. 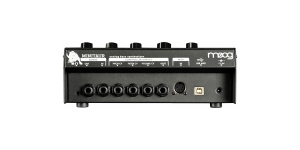 There are MIDI inputs (5 DIN and USB), main output, headphone output with preamplifier, input for external audio signal (it can be processed by VCF and VCA sections) and power supply jack. Sound Module/ Tone Generator, Analogue (A), Voices: 1, Paraphonic, Monotimbral, Oscillators overall: 3, Oscillators per voice: 3.